Pros: Lot of nice features. Image quality is very good. Cons: Really?! The email test result is useless ... only returns "test error". One egg because D-Link has a "Stupid User" attitude as evidenced by the minimal email configuration, the amateurism of the documentation, and non-existent support resources on their website. BTW ... I have a DCS-931L ... it took a little while to setup the email, but I was able to figure it out because the test result message was more informative. If you are going to make a high quality and feature rich product, then the configuration software and documentation must rise to the same level. Yes, we technology professionals want to incorporate ease-of-use for the non-technical folks. However, it is short sighted to degrade the product with a "Stupid User" approach to the setup and management. Yes, you can have technically oriented setup and management and then also "Non-Techie" helper features. I am 99.44% sure this problem is the result of poor decision making by management. Pros: Very easy to set-up. While this is wireless, I have one using the Ethernet connection as wireless does not cover that area., Great price. Cons: Dependedent on D-Links server for access. Cons: Spent several hours trying to connect to wireless router. Tried WPS, credentials, and every other way but it would not connect. Other Thoughts: I've had good luck with other Dlink products in the past but based on the amount of fruitless frustration this has put me through, will definately be my last. Pros: For the price, they get the job done and serve the purpose that I bought them. Set up was pretty straight forward with my D-Link router. 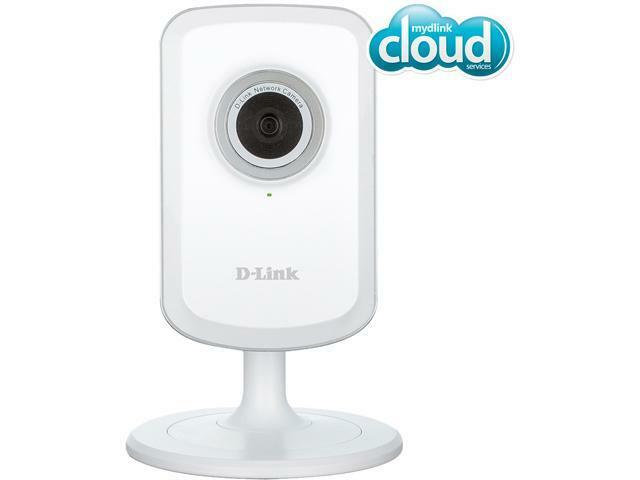 And since I have a D-Link Home Cloud App-Enabled router I was able to easily set up "mydlink" account" which allows me to view my cameras online. No port forwarding necessary. I also love the fact that D-Link has an app that allows me to view my cameras on my android smartphone and tablet. Other Thoughts: I've had nothing but good experiences with tech support. Recently I had to call in because I was unable to access the advance settings. I spoke with Rochelle (ID #AR004211). She was great. She patiently worked with me until my issue was fully resolved.And believe me, since part of my work consist of working with customers. I can be rather critical of customer service reps. Great products! Excellent support! Pros: Wireless Extender. And that about it. Cons: Camera froze everyday and sometimes can't even't reboot the device from web GUI. Drop this sale model. We want to thank you for the feedback as we take the input into great consideration and we are sorry to hear that you encountered issues with the product. We advise you to factory reset the camera (by pressing the reset button with a paper clip for 10 seconds) and then download and install the latest firmware from www.support.dlink.com. If that does not resolve your problem feel free to contact us for assistance by calling 1-877-453-5465. Thank you for choosing D-Link. Cons: Wireless card is a bit weak, not a huge deal though. We want to thank you for the feedback as we greatly appreciate the input and we are glad to hear that you are happy with your purchase. Thank you for being a D-Link customer. Pros: Read the other reviewers Pro reviews. I agree with them rather than restate the obvious. PLENTY OF BUGS- rather than go go into it here, go to their website and read the forum on D-VIEW CAM FAQ's and BUG REPORTS. D-LINK may be fixing them as we write but I am writing this today..I have see no new releases. Biggest bug in my opinion..D-VIEW CAM only recognizes D-LINK cameras!!! Other manufacturers camera and software recognizes all camera's. So how do you get support if you are using camera D and Software T? I understand but cannot experience D-VIEW cam will only allow you to view 1 camera live. My other software that came with another manufacturers camera allows me to view it's camera and my D-link live at the same time. Other Thoughts: I am a NEWEGG EGGPERT REVIEWER. I don;t get paid but sometimes I get to keep the product. This one is going to my daughter and my newborn grandson. I am keeping another manufacturers and moving forward to TPZ. They are now under $100. 1 egg off- buggy software. 1 egg off-no linux-apple-chrome support..they are O/S's becoming popular. and a DLINK router can operate with them so...there you go another egg. If DLINK routers can handle various manufacturers computers with multiple OS's. They are not whole heartly in the IP wireless cloud camera business. I suspect the guts of both my camera's come out of the same off shore factory.. the start up manuals are virtually word for word..
Pros: Setup is for the most part plug and play, The camera will automatically setup port forwarding via Universal Plug and Play (UPnP) and get a DHCP address when you wire it in via an Ethernet cable. If you don’t have an Ethernet cable, that isn’t an issue either as this device has a WPS button making connecting to wireless really easy. Finding it on the network is simple with the setup software, locating it automatically, instead of searching through manually. And of course you can set it up all manually without the software (Get the IP address either via a IP scanning tool or your routers DHCP address leases, and set it up through there. The picture quality isn’t HD (to be expected its 640x480), but it is still clear enough, and is compressed with H.264. Motion detection is great, you can have it email pictures to yourself when motion is detected (can configure the motion sensitivity too) I found that 35-40% work for my uses. I have mine setup to email my Gmail address. You can also have it email you the audio that it hears, or a video clip. There is of course a smartphone application to view your camera remotely, you can either use the cloud camera functionality, or you can use mydlink Lite, to connect to it (would recommend using a dynamic DNS service is you go that route, as your average household IP changes with some frequency). The WiFi range extender is a great option to have on this camera, more wireless devices should have this functionality, it is limited to a maximum of 5 client devices. I have never encountered a wall mounting system so simple as this, you pop off the camera, attach the base to the wall (with the included screws) and pop on the camera. Other Thoughts: Image quality wise it is very similar to my DCS-930L, there is about a 1-2 second delay between the camera and what you see, even on LAN, but that is to be expected. The ability to turn off the green light on the back is nice, I find that it is too bright. The final setup I did without D-Link’s cloud, I like my privacy, its not that I don’t trust D-Link, however only having me know the information to access the camera and not have it stored in servers is comforting. Viewing the video either requires an installed ActiveX control (IE only) or Java installed (any browser).